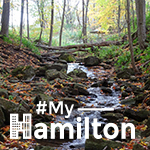 Whether you’re hiking in time for spring blooms or the changing of the fall leaves, keep this list handy to help guide your Hamilton trails adventure. Christie is basically a giant outdoor playground with a beach and disc golf, and great hiking trails. There’s also a special area of singletrack trails through the pine forest for mountain biking that are maintained by the Hamilton Burlington Mountain Biking Association (HBMBA). There are just over 10 kilometres of trails (with more in the works). Difficulty/Terrain: Some doubletrack trails with gravel or dirt. Bike trails are a clay/dirt surface with a few rocks and roots and range in difficultry from easy to intermediate. Highlights: There is a bakery directly across the street from the conservation area entrance—The Tiny Shop Bakery—with fantastic pies, Belgian cookies and other post-ride or post-hike snacks. The most popular feature of this hiking area, located in Stoney Creek, is the colourful, rocky gorge that is part of the Stoney Creek escarpment. It shows off over 40 million years of history with its layers of Queenston Formation red shale, grey shale and limestone and shale dolomite that were formed by inland seas. Devil’s Punchbowl Falls features the Upper Falls (a 33.8-metre ribbon waterfall) and the Lower Falls (a 5.5-metre classical waterfall).  Difficulty/Terrain: Difficult—expect dirt, grass, wooden stairways and bridges. Length: The trail is 2.5 km one way. You can also get on the 11.5-km Dofasco 2000 Trail through upper Stoney Creek that features a boardwalk through Vinemount Swamp Forest. 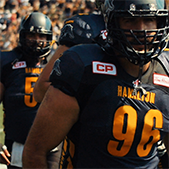 Highlights: Be sure to stop at the lookout for views of Stoney Creek and Hamilton Harbour. The Punch Bowl Market & Bakery is a great place to stop for fresh baked treats both sweet and savoury. The word “karst” isn’t one you hear often, but there happens to be one that you can visit in Hamilton. According to Merriam-Webster, a karst is “an irregular limestone region with sinkholes, underground streams and caverns.” The first time visiting this conservation area in Stoney Creek, it’s fun to be on the lookout for the caves this area is known for that are scattered along the trails—it features the longest in Ontario at 335 metres. However do be careful going off-trail as many caves are underground and can fill with water after heavy rains. Difficulty/Terrain: The terrain here is fairly flat, but watch your footing in some uneven areas. Highlights: While in the area, check out the beautiful Albion Falls just a few minutes away. The cascading falls, flow down the Niagara Escarpment into the Red Hill Valley. And don’t miss the stunning views of the city from Mountain Brow Boulevard. Nearby restaurants and movie theatres are located at the Winterberry Plaza on Paramount Drive. Visitors looking for an overnight stay, can visit the beautiful C Hotel by Carmen’s. The Dundas Valley is a lush, hilly 1,200 hectares of forest featuring deciduous Carolinian trees, streams and a 40-kilometre trail system. The Main Loop Trail is a popular one, with several offshoot trails. The Bruce Trail and the 32-kilometre Hamilton to Brantford Rail Trail also intersects the valley and runs past the main trail centre, with its covered pavilion. Take the Main Loop Trail to see the restored Hermitage Ruins and the Heritage Trail that leads to Canterbury Falls. Difficulty/Terrain: Moderate to difficult: Some parts are rooty and hilly, while others are fairly flat and even. Length: Main Loop: 3.4 km; Heritage Trail 1.8 km. 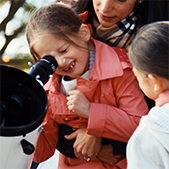 Highlights: Plan to picnic at The Dundas Valley Trail Centre. 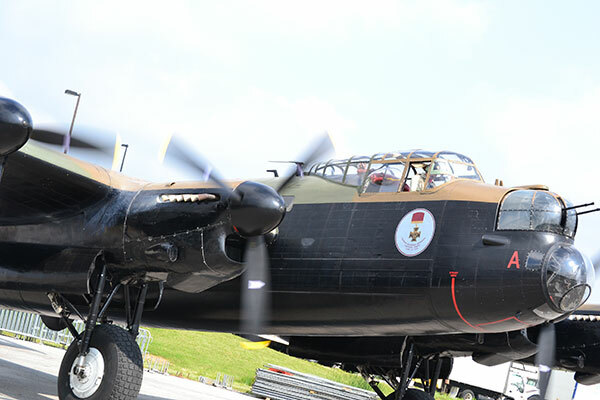 It features outdoor tables and washroom facilities (when its open). Or, head right into Dundas and stop for drinks at Grupetto, Shawn & Ed Brewing Co., Detour (where there are hanging racks), etc. Venture into Hamilton’s Westdale neighbourhood of shops and restaurants and it might not be apparent that behind it, lies a forest with a few different hikeable loops. 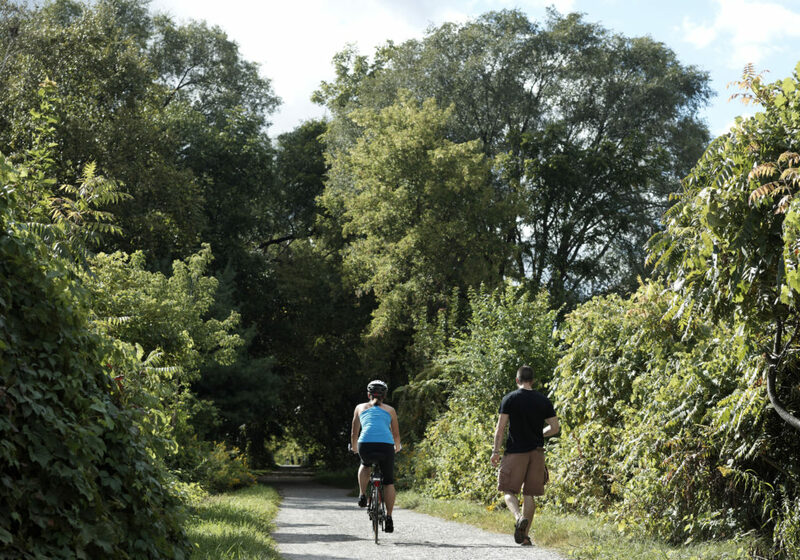 These trails are part of what’s known as Cootes Paradise, an 840-hectare sanctuary for animals, birds, and marine and plant life that’s managed by the Royal Botanical Garden. There are 27 kilometres of trails to explore. A popular one is the Ravine Road/Sassafras Trail, which you can access from McMaster campus, or park by the aviary and hike up Caleb’s Walk to Ravine Road Trail, which turns into Sassafras Point Trail. At the end, there will be views of Princess Point. Length: 3.4 km – about one hour out and back. Highlights: This is a great area for families given its proximity to the restaurant, shops and café’s in Westdale neighbourhood. You can also see if there are any birds out at the Aviary or head to the Churchill Park playground. You also get an insider’s view of Cootes Paradise from the tip looking towards the York Boulevard bridge. Parking: There is metered parking on Oak Knoll Drive in Westdale, which is free to Royal Botanical Garden members. This path that leads from downtown Hamilton up above Albion Falls was established in 1993 on an old CN rail line. It is also part of the Trans Canada trail network. The main route is paved and on a gradual slope, which makes it perfect for families on foot and with bikes. Visitors are asked to stay on marked paths and avoid entering prohibited areas. Highlights: From here, you can also get onto the Bruce Trail which follows follows the edge of the Niagara Escarpment, one of the thirteen UNESCO World Biosphere Reserves in Canada. Bus route: Several HSR routes go past the park. If you want to make a day of it, you can keep going once you get to Albion Falls from The Escarpment Rail Trail (see above). Or, you can park and set off on a fresh hike, starting at Buttermilk Falls with a side trip to Albion Falls and then heading out on the Bruce Trail. Difficulty/Terrain: Mix of gravel, soil, boardwalk, etc. Quite hilly in the King’s Forest section. Several parking lots available to visitors including off Mountain Brow Blvd. and Arbour Road. See map link above. This area is probably THE hiking hotspot in Hamilton (it’s not uncommon to see a bus dropping people off). This congestion is the reason why parking has now been restricted for the busy summer season (see below). For this reason, you may want to come during the week. Also, since a part of the Bruce Trail was closed, you now have to take the road to get between two of Hamilton’s more popular waterfalls: Webster Falls and Tew’s. It’s from this latter ribbon waterfall that you can make your way up to the Dundas Peak. At the top you’ll be rewarded with a pretty spectacular view of the Dundas Valley. Come in the fall to take in the magnificent colour of the leaves. Highlights and tips: Check out this Spencer Adventure map, a longer route that was created to combine history and nature. Head into Dundas for refreshments (see Dundas Valley). There is no on-site parking at Webster or Tew Falls during weekends and holiday Mondays from April 19 to October 27, 2019. On weekdays, during peak season, limited parking is available near Webster Falls at the parking lot off Fallsview Road via Short Road and limited parking available near Tew Falls at the parking lot on Harvest Road. This hike allows you to see a couple of waterfalls. If you park at Tiffany Falls, it’s a short walk to see the falls (in the winter, this is the waterfall that the ice climbers come to). Then, carefully cross Highway 2 (Wilson St.) to do the Sherman Falls hike, which is part of the Bruce Trail. This will take you the 17-metre-high curtain waterfall that is named after the founder of Dofasco, one of the city’s steel companies. It’s on private property, but along the Bruce Trail, so you can see it. 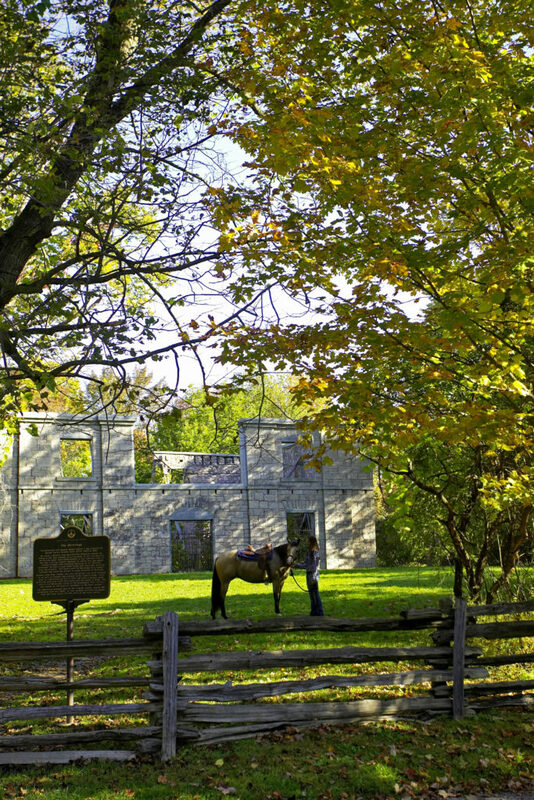 Highlights: After your hike, be sure to visit nearby Ancaster village. This historic downtown features Fieldcote Memorial Park & Museum, a cultural heritage centre showcasing local history and natural heritage, and many great restaurants and cafes, including Ancaster Mill, Rousseau House, Coach and Lantern, Cavallo Nero and Caniche French Bakery. Overnight visitors, can lay their head down at the newly opened historic inn Barrack’s Inn. Map to parking lot: There are a couple of places to park. 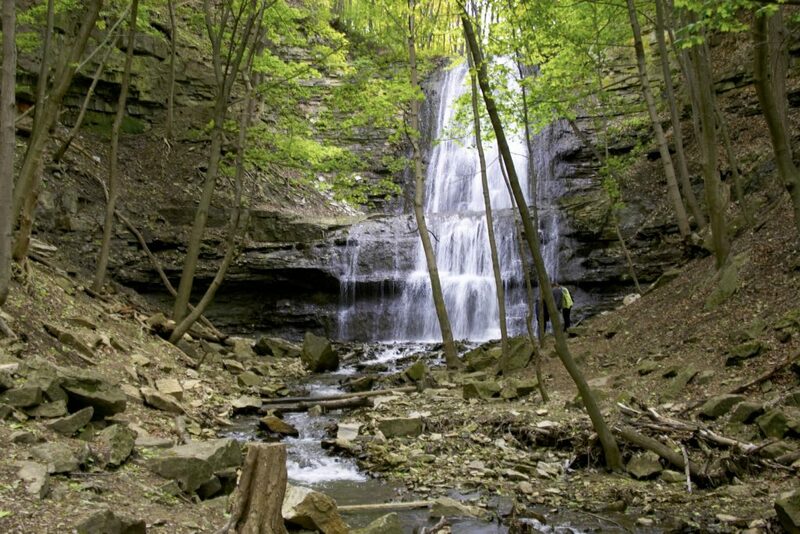 The Tiffany Falls parking lot will allow you to see both falls or the lot on Arteban Road, which will then allow you to hook up to the Dundas Valley trail system. The Chedoke Golf Course off Aberdeen is a popular meeting point, not only to hike the Chedoke Radial Trail up the escarpment, but also to work out on the 289 Chedoke Stairs that give you a direct route to the top of the escarpment. The trail is also is part of the Bruce Trail, with side sections that go off the main Rail Trail. Difficulty/Terrain: There is a slight grade as you walk or ride up the escarpment, but rail trail itself is dirt. Highlights: Check out the Lower/Upper Chedoke Falls (there is a new viewing platform at the top on Scenic Dr.). Parking: Most people will park at Chedoke Golf Course and start their hike from there. Hamilton’s waterfront used to be an industrial zone, but in recent decades, much of it has been revitalized. The Waterfront Trail, for example, is a great place to bring your family on foot, bikes, strollers or rollerblades. Come in the late spring and you’ll see baby swans and ducks along the shores of the bay. 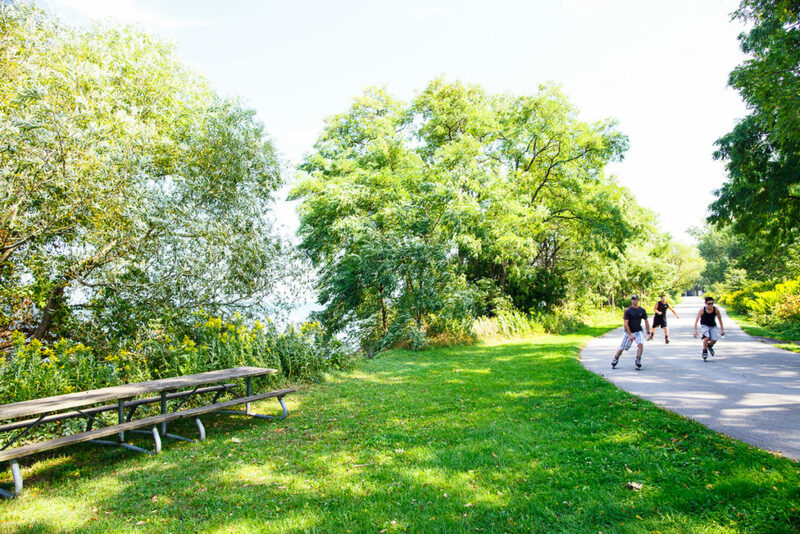 Bring a picnic as there is lots of green space where you can eat at Bayfront Park or head to one of the restaurants at nearby Pier 8 or along James Street North. 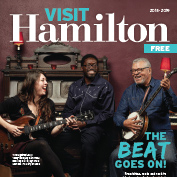 Check the Tourism Hamilton site ahead of your visit to see if it coincides with any summer festivals or events. Food-wise, Williams Fresh Café is a great place to refuel when you’re on a long walk or ride. And don’t miss the rollerskaters, out at Pier 8’s waterfront rink, skating to music on many summer evenings. Parking: There are various free and metered parking lots along the route including Bayfront Park and Princess Point. Bus route: The trail is well serviced by bus routes. Enter your starting address in the HSR Trip Planner for details.